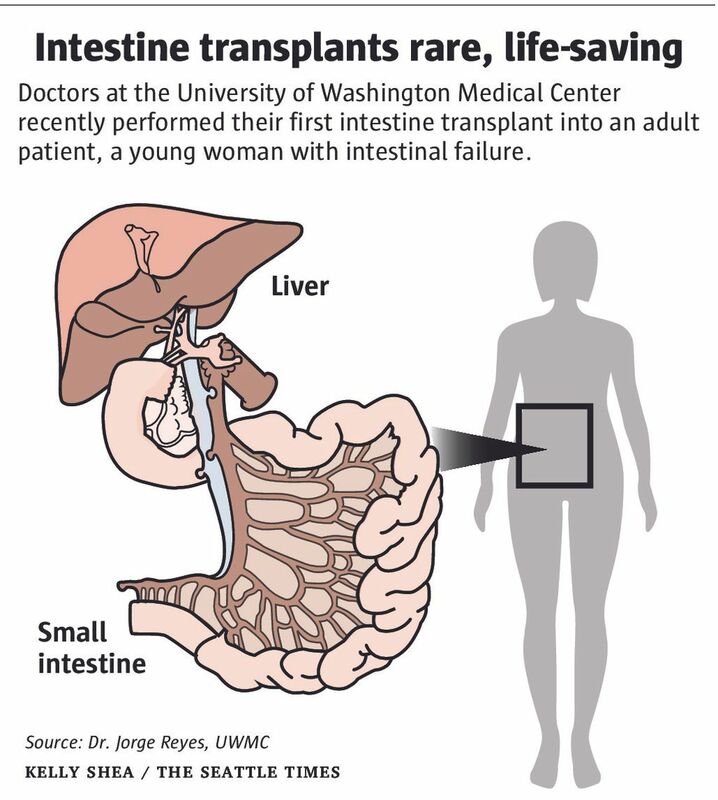 A 26-year-old Pierce County woman received a rare intestine, liver and pancreas transplant at University of Washington Medical Center last month, the first for an adult in the Northwest. Savana Oberts remembers sitting in an East Asian Studies class at Western Washington University in May 2011 when she felt a sudden, sharp pain deep in her abdomen. Within hours, the 21-year-old from Lakebay, Pierce County, was in emergency surgery, fighting for her life. A kink in her small intestine, linked to an undetected birth defect, had cut off the blood supply to her right colon, which had to be immediately removed. 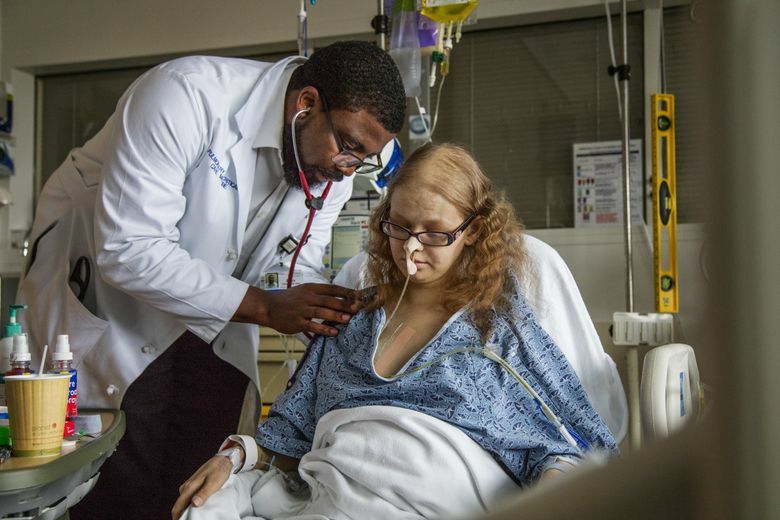 Almost overnight, she went from being a healthy, active young woman to a person whose only hope was a rare intestine, liver and pancreas transplant. But Oberts would have to wait five years, until just last month, before doctors at the University of Washington finally found a suitable donor to complete the rarest type of organ transplant there is. She grew sicker and sicker, her skin yellowing from the effects of liver failure. “Her condition was desperate,” said Dr. Jorge Reyes, the UW Medicine chief of transplant surgery who performed the 16-hour operation Aug. 8 to remove the organs from a deceased donor and transfer them to Oberts, now 26. The procedure marks the first adult intestine transplant performed at UWMC, and one of just eight ever in the Northwest region that includes Washington, Oregon, Idaho, Montana and Alaska, federal data show. But it also demonstrates the maturation of the UW’s intestinal rehabilitation program, started by Reyes four years ago to treat patients like Oberts whose guts were failing. So far, Oberts’ operation has been a success. She was out of her hospital bed at UWMC during a recent visit with Reyes and other doctors. She was still weak, and had a drain tube in her nose, but she summed up her reaction with a quiet smile. Reyes is considered an expert in intestinal transplants, having performed or participated in about half of the 2,745 transplants conducted in the U.S. since 1990. He was part of the team that developed the protocol at the University of Pittsburgh, noted Dr. Kareem Abu-Elmagd, director of the transplant program at the Cleveland Clinic in Ohio. “We are proud of him, and if anyone can establish a small-bowel program, it’s Jorge,” said Abu-Elmagd, a longtime colleague. In the transplantation field, intestinal transplants are particularly tough. They’re performed far less often — only a few thousand in the past quarter-century, compared with nearly 400,000 kidneys, for example. And they require a skilled, multidisciplinary team to manage everything that might go wrong, Abu-Elmagd said. “It takes 10 times the effort to take care of these patients and a system that can understand the complexity of these patients,” he said. Though Reyes often tells patients, “It’s a plumbing problem we have here,” intestinal transplants are far more than that, he acknowledged. Many patients, like Oberts, have what’s called short bowel syndrome, or SBS, also known as “short gut,” a condition caused by the surgical removal of a portion of the small intestine. It’s rare, affecting about three of every 1 million people, according to the National Institutes of Health. People with SBS can’t absorb enough water, vitamins, minerals, protein, fat and other nutrients from food, so they receive supplements known as total parenteral nutrition, or TPN. For five years, Oberts received TPN every night through a port in a vein. In recent months, the treatment started failing. Intestinal failure also wipes out the body’s innate immune system and damages a site in the body with a high number of nerve cells, second only to the brain, he added. “When you say you have a gut feeling, there’s a reason for that,” Reyes said. Oberts was in and out the hospital, battling a failing liver and infections that overwhelmed her weakened immune system. Finally, this summer, a donor was found, one with the right tissue type who was small enough to match Oberts’ 5-foot-1 frame. “I said, ‘Don’t discharge her. We’re going to transplant her on this admission …,’ ” said Reyes, recalling his own urgency. Oberts is still receiving fluids and nutrition through a tube; she won’t be able to eat on her own for a few more months. But the long wait for new organs is over and Oberts said she’s finally looking forward to the future. “I’ll be able to go and do something,” she said. Intestinal transplants are among the most expensive transplant operations, estimated at $1.5 million, according to 2014 estimates by the actuarial firm Milliman. Oberts’ costs are mostly covered by Medicaid, but family and friends have donated more than $15,000 through an online fundraising site. Slowly, things may get back to normal, said Cathy Oberts, Savana’s mother.